You can get access to the configuration of tasks by double clicking the Schedule Task icon in the main window or by selecting menu command File / Schedule Task. Name — the name you gave to the task. The icon preceding the name will indicate task status - for an enabled task and for a disabled one. Status — either enabled or disabled. 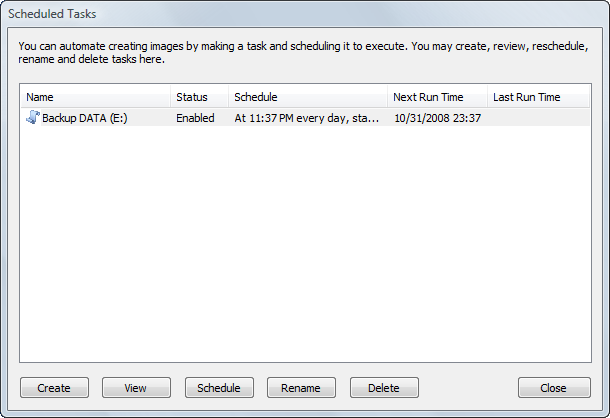 If you have a task and do not want it to be executed you might temporary disable it instead of deleting it. Schedule — a short description of time (condition) to which the task is scheduled. Next Run Time — time at which the task should run. Last Run Time — the most recent time the task was executed. To create a new task, click the Create button. You may create tasks for both a Backup Disk Image and a Raw Disk Image. The second wizard dialog asks you to choose a backup type. The dialogs that follow are exactly the same as in the Disk To Image and the Create Raw Image wizards except you cannot schedule an image to be burnt onto CD/DVD.